I counted about half of Cherry Hill's residents at my local ShopRite last night stocking up on milk, orange juice and other staples in anticipation of the snowstorm predicted to hit the region today. I think some gluten-free baking is in the cards for tomorrow since it doesn't appear that we're going anywhere! The Greenwood Kitchen in Lansdale was featured in Monday's post. The company makes gluten free "raw" snacks like macaroons and granola and baked goods such as muffins and breads. Whole Foods in Devon is the latest area store to carry these products. "Pizza Pizza" is the theme of the restaurant news this week. West Berlin Italian Filomena Cucina Rustina (13 Cross Keys Road, 856-753-3540) has many gluten-free menu choices, including brick-oven pizza, penne, ravioli and gnocchi. Brothers Pizza & Pasta in West Chester (670 Downingtown Pike, 610-431-1000) is the latest restaurant to add Still Riding's gluten-free pizza to its menu. Don't forget about the still-running offer from Still Riding, which allows Gluten Free Philly readers to get $100 for referring to the company a local Italian restaurant or pizzeria that decides to carry its gluten-free pizza. The Warminster outpost of Roman Delight (255 East Street Road, 215-957-6465) not only has gluten-free pizza, but also pasta, entrees and beer. The Seasons Pizza location in Cherry Hill, serving gluten-free pizza and french fries, is offering 10 percent off your next dine-in or delivery order. Just mention the store's new blog for the discount. Horsham's Grandma's Grotto has posted its expanded gluten-free menu - including many varieties of pizza - online. I just learned of a new dedicated gluten-free baker located in the Philadelphia suburbs. The Grain Exchange in Buckingham (267-935-9244) sells direct to customers as well as to area stores and restaurants. Several varieties of the company's baked goods are sold at the Town Crier Bakery at Peddler's Village in Lahaska and at Saxbys Coffee in Doylestown and Lansdale, among other places. General Mills giveth and General Mills taketh away. Strawberry Chex cereal, which was reformulated last year to be gluten free, has been discontinued due to disappointing sales. 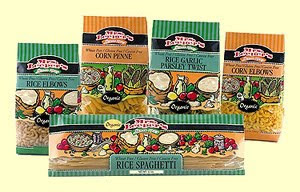 As part of its February grocery deals, Amazon.com is offering up to 40 percent off most Mrs. Leeper's gluten-free pasta products. Save 25 percent when you enter code LEEPER25 at checkout, plus save an additional 15 percent (with free shipping) when you combine the instant rebate with a Subscribe & Save order. Amazon.com's up-to-30-percent-off sale on the entire line of Betty Crocker gluten-free dessert mixes continues through the end of February. With that offer, you can save 15 percent by using code BETTYCGF at checkout and an additional 15 percent (with free shipping) when placing a Subscribe & Save order. The Bucks/Montgomery R.O.C.K. chapter is sponsoring a moon-bounce jump party and potluck dinner on Sunday, February 21. The event will be held at Pump It Up at 94 County Line Road, Suite A, in Colmar from 4 p.m. to 6 p.m.; the bounce runs from 4 p.m. to 5:20 p.m. with dinner to follow. All family members are welcome. The cost is $10 per child for Pump It Up with adults free (socks required). For the dinner, attendees should bring a dish and the recipe to share. The facility has a refrigerator and electrical outlets available if needed. Bottled water and Capri Sun must be purchased through Pump It Up, which the group will cover. RSVP with the number of attendees and childrens' ages by February 16 to Holly and Steve Staugaitis at 215-997-2706 or 267-664-6425. I'm still soliciting interest in an upcoming gluten-free dinner meet-up at Casona in Collingswood, so if you're interested, please complete a short survey through this link by Tuesday, February 9.